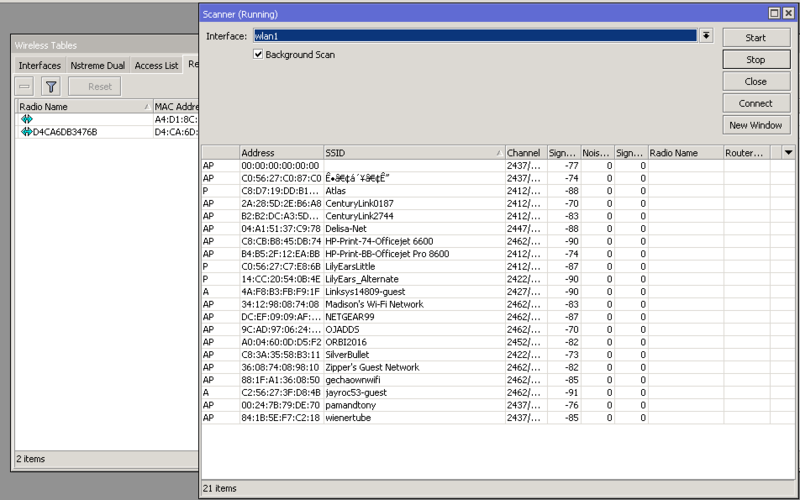 Beginning with Mikrotik version 6.35, the availability of Background Scan on the wireless interface. From the wiki: "The scan command allows you to see available AP's in the frequency range defined in the scan-list. Using the scan command the interface operation is disabled (wireless link is disconnected during the scan operation). Since RouterOS v6.35 (wireless-rep) background scan is supported which can be used during the wireless interface operation without disconnecting the wireless links. Background scan is supported only using the 802.11 wireless protocol." This is a great way to scan for other wireless networks without disrupting the registered clients. Notice in the screenshot, clients are connected but I am still scanning.